Disabled pensioner cries neglect at MGMH – … she was left starving from Tuesday evening. 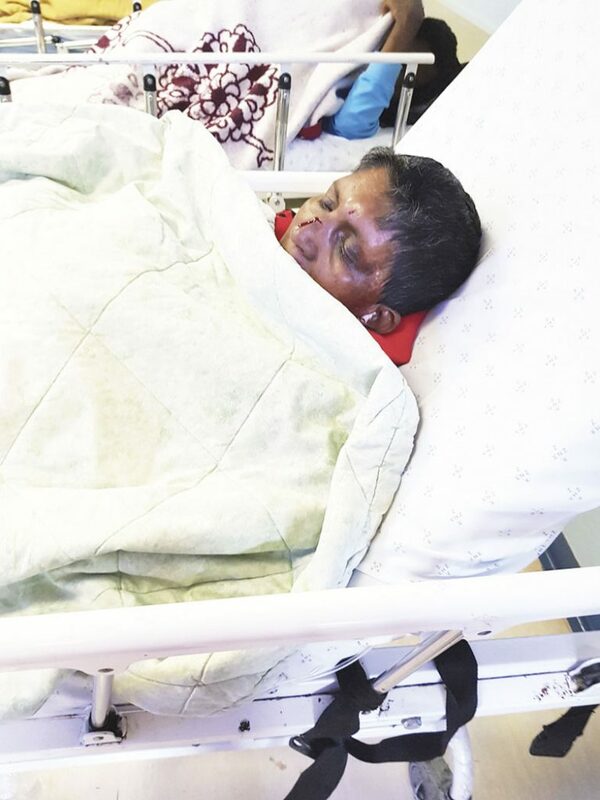 A 62-year-old partially disabled Phoenix pensioner was found bloodied and lying on the floor at Mahatma Gandhi Memorial Hospital (MGMH) after she was left neglected for close to 48 hours with her pleas to go to the toilet allegedly ignored by nursing staff. Beenarai Ramdeyal, was rushed to MGMH on the evening of Tuesday, 15 January and was only admitted on Thursday. Speaking to The Phoenix Tabloid, Beenarai’s neighbour who is also her caregiver, and who wished to remain anonymous, said he was disgusted by the manner in which the sick and elderly are treated at MGMH, especially after witnessing the dismal treatment Beenarai endured at the hands of staff at the local government hospital. “Beenarai walks aided by crutches and she is also on medication for her mental condition. She suddenly took ill and I rushed her to the hospital as her family lives away from Durban. I waited with her as she sat in her wheelchair from 5pm till midnight. No medical staff attempted to assist her despite please for help. The security guards kept chasing us away but how could we leave a sick and elderly woman unattended. “At 2am on Wednesday morning, a doctor said that Beenarai will be admitted and told us to go home. Sadly, this never happened. When I returned to the hospital on Wednesday afternoon, Beenarai was seated in the same wheelchair in the same Medical Outpatients Department (MOPD) but a nurse was with her. She wanted something to eat as she was left starving from Tuesday evening. I hurried out to buy her some food and when I returned, I could not find her. I looked around and found her a short distance away, face down on the floor,” said the incensed caregiver. then took the initiative to help her back on to her chair. She was disoriented at that stage. I was angry and looked in shock as the nurses walked around, busy on their cellphones, whilst a very sick patient was left neglected and to fend for herself in her state,” the furious caregiver added. no feedback. The Phoenix Tabloid contacted the acting chairman of the hospital board at MGMH, Mervyn Reddy, who was alarmed to hear of the incident. “Firstly, I have informed all necessary authorities at the hospital of the incident and this matter will be investigated. I do not accept that security guards should intervene in the care and treatment of a patient. We have professional staff at the hospital to fullfill that role. It is unbelievable to hear that trained medical staff at the hospital whose duty is to attend to the sick failed to do so in a prompt, professional and timeous manner. Certainly, this warrants investigation and anyone found guilty on grounds that leads to gross violation of medical treatment, leading to neglect of a patient, will be dealt with accordingly. “No patient should be made to be left waiting lengths of time for treatment. This will not be accepted at MGMH. We strive to abide by the Batho Pele principles in our medical facility and a violation thereof must be lodged as a complaint and will be investigated further,” Reddy said. Beenarai has since been discharged from hospital and is making a slow recovery at her residence.